We have until Thursday the 17th of April to make a written submission regarding the application of the new zoning regulations in Darebin. It is critically important that you participate in the feedback on draft amendment C144 to help ensure that you get the zoning protection you desire in your street/neighbourhood. The right zoning protection in your neighbourhood will alleviate the ongoing vigil of planning applications and rounds of objections and VCAT appearances to try and prevent over-development in your streets. Because your neighbourhood has its own specific characteristics that you appreciate and want protected a personal submission is appropriate to detail those in a way the DADA submission doesn’t. I have attached the DADA submission in case it is of some help, cut and paste from it as you like, no need to reinvent the wheel. If you are prepared to talk to the panel then I don’t think it is necessary to submit too much detail in writing, just broad points should be fine that you can flesh out later in person. If you can’t make a panel presentation you might want your written submission to be more detailed. For most of us the key issue will be protection from over-development under the Neighbourhood Residential Zone (NRZ). Look up your street on the map; and see if in the draft it is protected. I have attached a document, AN50, which outlines criteria for application of the NRZ so that you can decide if your street qualifies. Even if it doesn’t strictly qualify you can argue that council does have flexibility in applying the criteria and so your street should be considered. If you are near a school you should push protection for that reason alone – see the DADA submission. Contact me if you have any questions. Good luck. 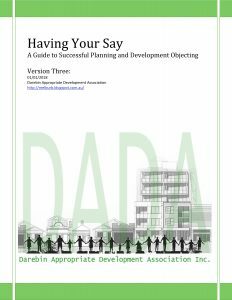 Thanks to those who have sent me feedback on the DADA zoning submission. As it hasn’t yet been submitted I have been tweaking in the light of that feedback. 1. Schedules should insist the inclusion of a landscape plan with the planning application so that planners, councilors and objectors can see a more compete picture of the development planned. 2. To stem the ongoing loss of canopy vegetation due to over-development in Darebin, schedules should mandate the replacement of substantial canopy trees at a rate of one for every ten years of life of the tree removed. I also upped the request for the School Protected Zones to cover 5 blocks around schools and take out the statement about not crossing a major road.